2004 Venus Transit - "Black Drop"
Transits of Venus are rare events, occurring in pairs separated by eight years which themselves are separated by, alternately, 121 or 105 years from the previous pair. The last transit of Venus before 2004 occurred in 1882. Most of the Eastern Hemisphere was well-positioned to view the 2004 transit, with weather conditions favoring the Middle East and southeastern Europe. I viewed the transit from southern Greece with a tour group led by solar eclipse and transit expert Fred Espenak. Weather conditions were good for most of the transit, until clouds appeared about two hours before second contact. This image was taken at second contact, and shows the "black drop" effect connecting the outer edge of the shadow of Venus to the black edge of space beyond the Sun's limb. This effect results from blurring caused by atmospheric seeing and optical diffraction, combined with darkening of the extreme edge of the Sun's limb. 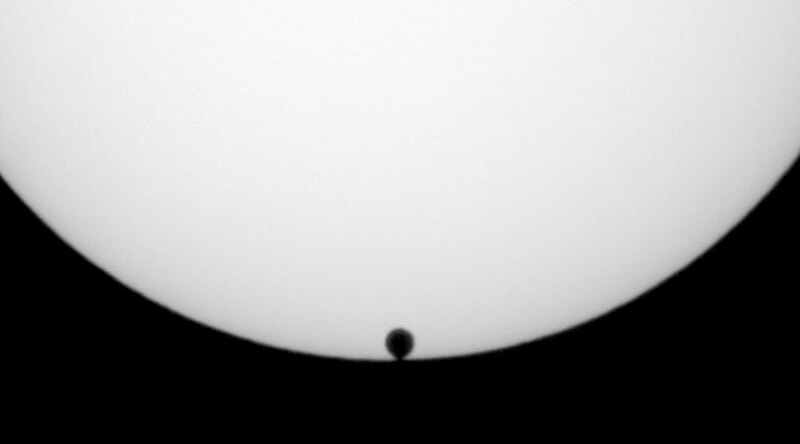 Venus' apparent diameter during the transit was 61 arcseconds.